Social Security’s revenues and benefits are set by Congress, making the program’s solvency a political question. 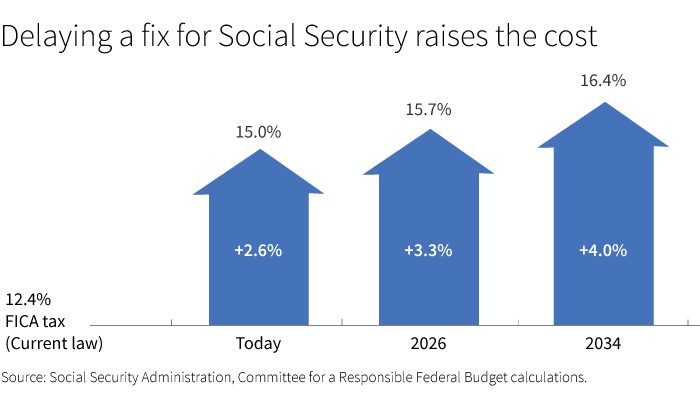 Modifying policies around Social Security taxes may help lessen the funding shortfall. Raising revenues and reducing benefits may become more painful the longer we delay action. Most people recognize the need to strengthen Social Security. Each year the Social Security Trustees provide projections of how long the trust fund assets will last based on required payments by Social Security and Medicare. The numbers make the case for reform. In essence, fixing Social Security is a political issue, but there are many options available to Congress based on well-understood mathematics of revenues and distributions. Over the years, several publicly appointed commissions have made recommendations for reform, such as devoting greater tax revenues to Social Security, reducing future benefit increases, or finding ways to secure higher rates of return from assets in the trust fund. A few years ago, I met with then-Tufts Health Plan CEO James Roosevelt, a former associate commissioner of the Social Security Administration (SSA), to consider ways of fixing Social Security. This effort brought together two backgrounds: Jim’s years of experience leading one of Massachusetts’ private health insurers and working with Social Security, Medicare, and a range of programs that manage health expenses, and my focus on retirement readiness and workplace savings. We used our collective understanding to craft several ideas for Social Security. Hold tax rates steady, but gradually lift the ceiling on wages subject to Social Security taxes. Until the 1990s, that ceiling had included 90% of all wages. We should move back up to that 90% level by 2020 and then index the ceiling to future wage gains. Further enhance revenues by requiring future state and local government employees to join the Social Security system. Modify the way that the cost-of-living adjustments are calculated by using a revised Consumer Price Index that more accurately reflects the rate of inflation for the expenses of most seniors. Accelerate the increase in age to receive full benefits from 67 to 68 by 2030 and then index the full-benefit age for future generations to gains in longevity. Life expectancy past age 65 has risen nearly 50% since 1940 when Social Security began providing regular payments. Now that the full-benefit age is rising, we should also improve disability options, particularly for those in physically demanding jobs. No one should expect those working in manual labor sectors to work until their late 60s. Based on earlier estimates prepared in the 2010 report of the SSA’s advisory board, these ideas could eliminate nearly all of the funding shortfall over the next 75 years. The longer we wait to make changes, the wider the funding gap will grow. If we allow this to happen, deeper and more painful tax hikes or benefit cuts may be required to fix Social Security. Many Americans rely on Social Security to pay their bills when they retire. We should also back up Social Security with a stronger workplace savings system. We need to maintain existing tax savings incentives for 401(k) plans, IRAs, and other retirement vehicles, and extend workplace savings plans to all workers. To address this, a great bipartisan proposal has already been introduced – the payroll-deduction Automatic IRA. With more than three decades of distinguished leadership in the investment management industry, Robert L. Reynolds is regarded as a driving force of innovation and progress in institutional and retail financial services, and a thought leader in retirement industry development and policy. Currently he is President and CEO of Boston-based Putnam Investments and Denver-based Great-West Financial, and provides leadership and strategic direction to Empower Retirement, the retirement division of Great-West Financial. All book proceeds will be donated to charity. © 2019 Robert L. Reynolds. All rights reserved.